Please pardon the tired teacher eyes, it is Science Fair season, & as excited as I might be about passing a love of science onto my students, I am as equally terrified about grading 120 individual projects. After 6+ months into teaching, I am definitely finding myself putting on a "uniform" everyday. I have a signature print (polka-dots) that the students pointed out to me, & the other day a co-worker made an observation about the amount of blue that my daily outfits include. So I guess this outfit is as close to my teacher style as it gets. 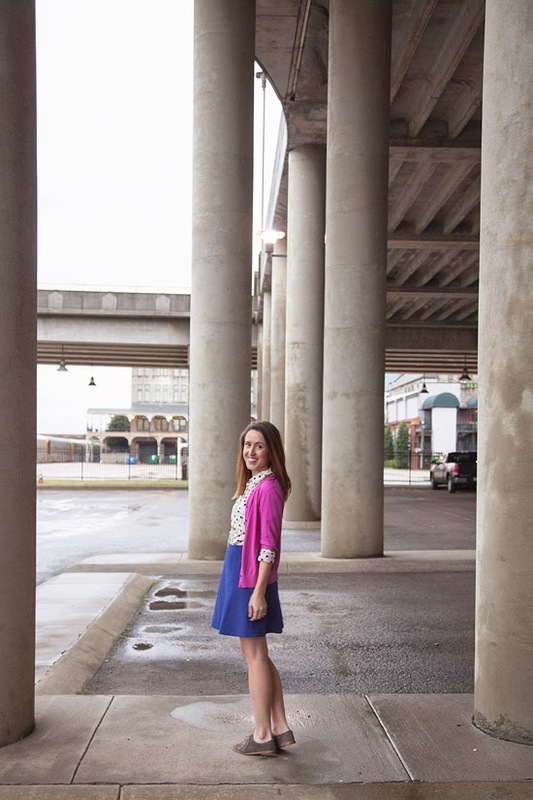 Flats for all day comfort, easy layers to battle the fickle radiators in our old historic building, & a skirt that is cute, but long enough to cover my caboose when I bend over to pick up something a child has dropped for the one millionth time. Have you ever come upon your "style" thanks to the observations of others? When I was at University one of my lecturers always referred to me as "You in the blue". I always find it interesting when friends and family show me pieces of clothing they think I might like. It is always interesting to see what other perceive as 'my style'. Good luck with all the projects! Simple, but very cute outfit! I like your polka dots blouse ! I love the bright colors! It is making me crave spring! I love this :) Those oxfords look so comfy! I love your teacher style! :) Polka and blue are two of my favorite things! I wish I could pull off oxfords though... I always feel like they make my short legs looks stumpy... oh well! Great color combo! You've inspired my own teacher look for tomorrow. I wish I had the legs to pull off oxfords like that. They look fantastic on you! I feel the same way, Shira! I really wish I had the legs for oxfords. Yes. A lot of people say I have a very retro or vintage style of dressing because I mix second-hand and vintage clothes with new ones and I have a sort of old-fashioned 1940's look. I also keep my clothes a long time, so no matter what I wear, it has that flavor. This outfit is just awesome! I love the blue and magenta together. That skirt is such a perfect length and style. Polka dots are so fun. They're a great signature print! Feel like our lives help structure our "uniforms" - even if we don't have a regular 9-5 kind of job. 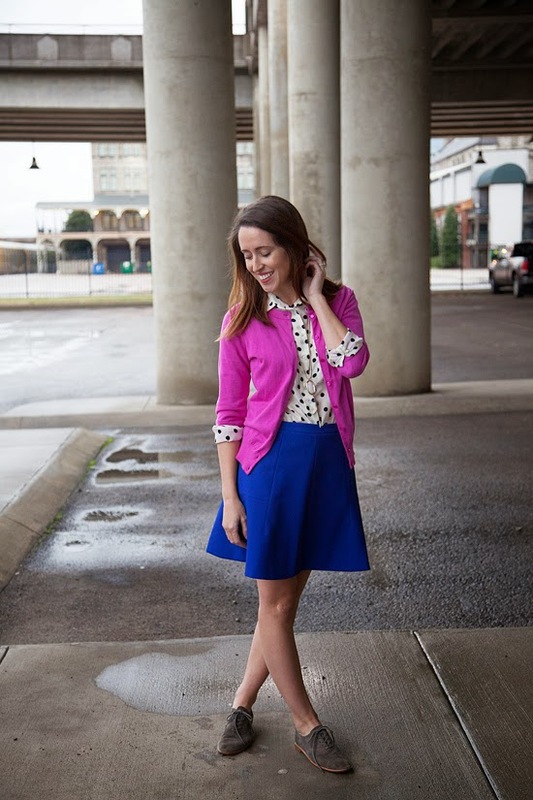 I love that you are wearing bold colors and polka dots! You look amazing. Really cute outfit! I love all these colors together! What a fun color combo! You look darling and I'm loving the polka dots here! !